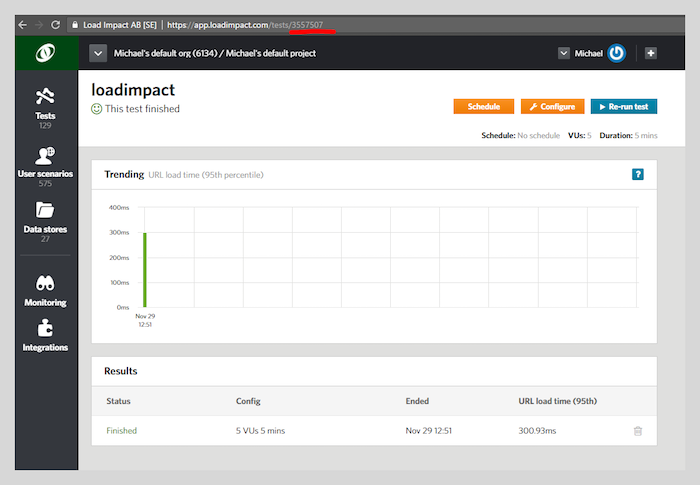 To get started, try this sample of how to include performance testing in your Jenkins Pipeline setup. This sample assumes you are familiar with Jenkins v2 and above. We set up a new pipeline and use the Blue Ocean UI to run because it looks nice. It also assumes you have a Load Impact account. If not, go get one – it’s free. We’ve broken down the integration process into four digestible steps, so let's get on with some automated performance testing! And here it is when we have executed a couple of times. Slightly more interesting – let’s take a look at the Configuration of the pipeline. 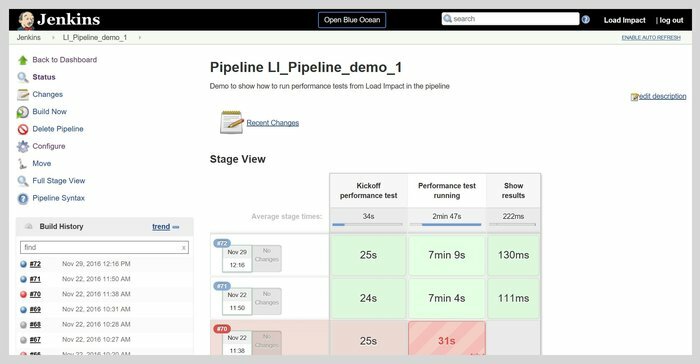 We set up a pipeline that only executes a performance test so you can include it as you wish in your pipeline. There is nothing else in this example. All the good stuff is in the Pipeline, so let’s go there and take a look. It’s all in the Groovy script for the pipeline, so we will take a look at what it does in some detail. You can get the code at GitHub in the loadimpact/jenkinsloadimpact repo where it is shared. Before we dive into the details — let’s get some essentials from your Load Impact account. We need the API key so you can access the API and a test to run. Now you need to know which test to run. You can list your test configurations using the API or the CLI if you want, but the simplest way is to open it directly in your account and copy the id from the URL. That’s underlined in red. Now you have a test id for the test you want to run in your build pipeline and your API key. All the code is shared at Github for your download in the loadimpact/jenkinsloadimpact repo! 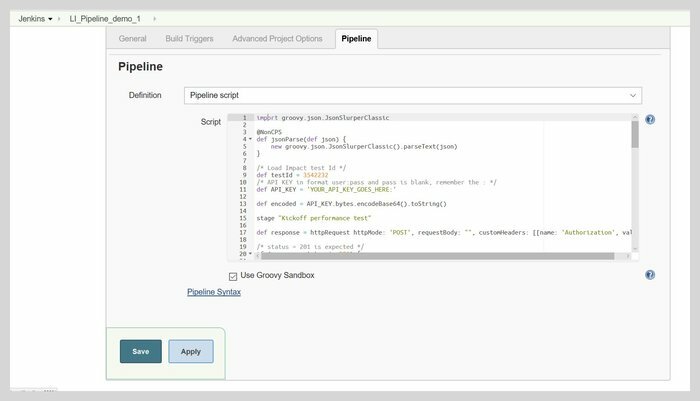 The code has four parts, the initial and then three stages: “Kickoff performance test,” “Performance test running” and “Show results.” If you’re familiar with Jenkins pipelines you know the stages will be visible in Jenkins when you execute your pipeline, including your Load Impact performance test. The initial part of the pipeline code is where you set the test id and the API key. So replace “YOUR_TEST_ID_GOES_HERE” with your test id, just the number – not a string. And replace “YOUR_API_KEY_GOES_HERE” with your API key. Keep inside the quotes (it is a string) and remember to keep the ‘:’ at the end. It is basic AUTH, the username is the API key with a blank password. You could of course user the Jenkins Credentials store for this and get the value from the Credentials Store but that is outside the scope of this sample. We import some stuff to help in handling the json responses from the API when we use it. 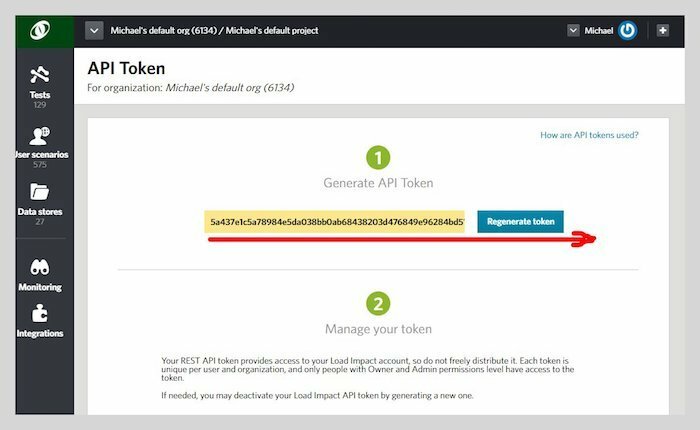 And at the end of the initial section the API key is encoded so it can be used in calling the API. At the “Kickoff performance test” stage we start by calling the API to start a test. We check the response and if it fails for some reason we just exit which will fail the build step in the pipeline. Parse the response and extract the running test id. Slowing down the wait is accomplished by simple sleeping 10 seconds between iterations. This time we wait until the test has completed, reached the percentage completed value of 100% with a slightly longer sleep between refreshing the status. We get the value by calling the same API as before but for the VU Load Time result, parse the json and for simplicity just get the last value (probably not the actual maximum since we would have needed to check all samples for that) and save the max of the last value and current max. If the value exceeds 1 second we exit the build step and fail the build in this example. The test however will continue to run so a useful addendum to the code could be to abort the test run at this time. Final stage “Show results” we just output the max VU Load Time. It can of course be any result but as a sample. You can of course use this result to decide on further actions in your pipeline. 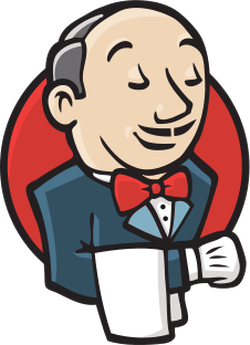 Finally, we can look at executing the pipeline in Jenkins using Blue Ocean because we think it's pretty handsome software. In the dashboard we only have a single pipeline for the purposes of this demo. And run. Open the running pipeline. Once it moves into running state it looks like this. Final stage – Show results. And there’s also a direct link to the full results and analysis in Load Impact where you can always find all the results of all your tests. 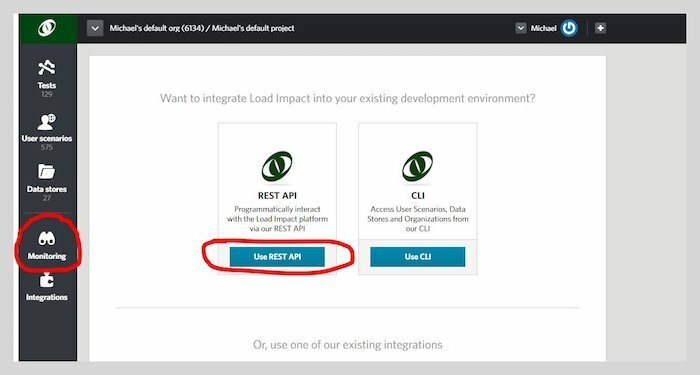 To dive deeper into using Load Impact from your CI/CD process (or for that matter any external usage) see our comprehensive API reference.